In Elorus you can create additional user roles beyond the 3 predefined ones you can find on the Users & Roles menu, depending on your needs. The predefined roles cannot be changed and have specific access limits for everyone. > The three main roles (Manager, Staff, Partner) are discussed in our related article, here. Role management allows you to decide what access rights your users will have by creating the respective roles. This way you can easily assign custom roles to users that you wish to have limited access in certain application menus while being able to perform certain actions only. 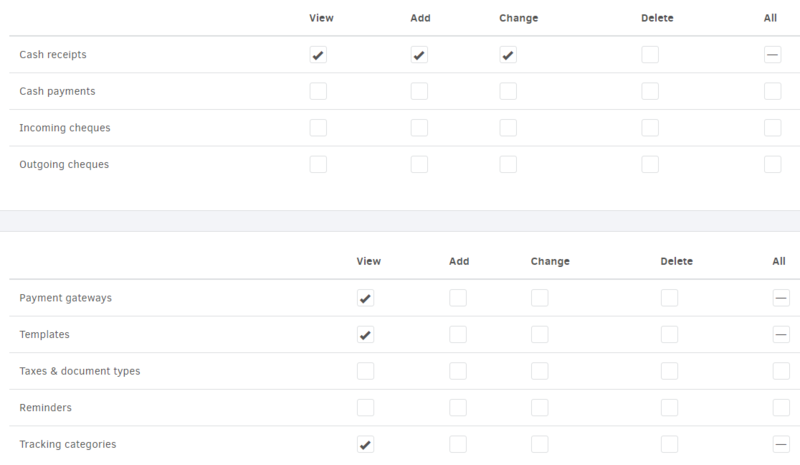 All roles can be managed from the Settings menu under Users & Roles -> Manage roles -> Add. Description: The description will be used for your own reference when assigning users. Choose if it’s an administrator: Administrators can manage users, update the organization profile & settings, as well as handle the Elorus subscription. Choose whether users with that role will be Time tracking managers. The Time tracking manager button is found at the Time tracking permissions, further below and you can enable or disable this option. Time tracking managers have access to all of the users' time entries. They can also assign time entries to other users on their behalf. > Users whose role isn't a time tracking manager can only view their own time entries. Email: Invoices, estimates & credit notes can be emailed to clients directly through Elorus. There is a separate permission for this action. > As you may have noticed, reports have separate permissions. For example, you may want to allow your employees to view / create new invoices, but not provide access to the profit / loss reports that reveal the business’ financial overview. > Some permission combinations do not make sense, and are therefore not allowed. For example, in order to edit a record, the user must also be able to view that record. In that sense, if you remove the view permission, all add, change & delete permissions will also be removed. > For convenience, there is a column named “All” towards the end of each permission row. Use the checkbox to add or remove all corresponding permissions at once. Modifying a role that is assigned to a user, will immediately affect his ability to access the organization data. You are not allowed to delete custom roles that are in use. Keep an eye on Elorus updates. The application is always evolving and new exciting features are being added. It is possible that a new feature may introduce a new permission section. In this case, we do our best to initialize your existing custom roles with permissions that make sense. However, you are encouraged to review the custom roles and make your own adjustments if needed. You can further refine the records a user can access, by limiting access per contact. The most common role a company can have is the salesperson. As expected, the salesperson must have access to the sales documents, be able to create estimates but at the same time not be able to view clients (and their transactions) that are assigned to other salespeople. Also, you may not want to grant them access to some options in the Reports menu, such as Revenue / Expenses reports and Cash flow. Here's a "Salesperson" role example you can follow or make the necessary changes that apply to your case. Once you've selected the permissions above, you can click "Save" and the new role will be available for use. If you want to invite your first salesperson to Elorus, go to Settings -> Users and Roles and click on "Invite user". There you are required to fill in the user's email address and their role in your organization. 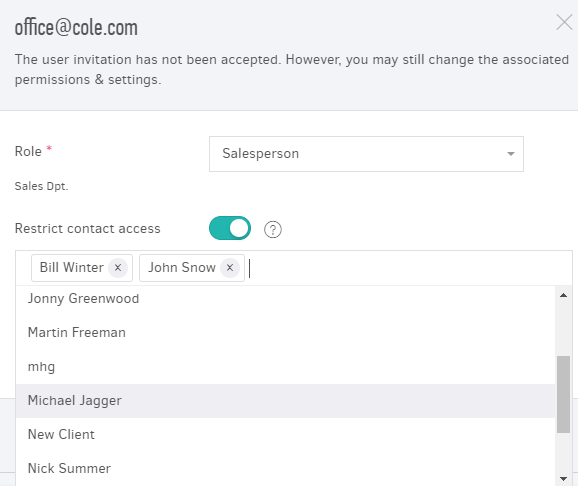 Select the Salesperson role and if you want them to have access in specific contacts only, you can assign them here by activating the "Restrict contact access" button and typing each contact's name. In order to send the invitation to the user's email, click on "Invite". > Important: Remember that in order to be able to invite new users, you need to make sure your subscription plan supports the corresponding number of users. At any time, you can check your user limit from the Users & Roles menu by hovering the cursor over the bar.